We’ve been following the progress of this Galpin Widebody Mustang since it was first announced back in August. We were able to bring you the first live images of the car just after its completion at Galpin Auto Sports’ shop in Southern California, and now we can bring you photos of the car straight from the auction block at Barrett-Jackson. SPX, the company who hired Galpin to build the Mustang, sold the car tonight in Scottsdale to the highest bidder, with the final price eventually reaching $160,000. This wasn’t for profit, though, as 100% of the proceeds from the sale were donated to the St. Jude Children’s Research Hospital. Summary: One-of-a-kind with blown 5.0 Liter engine, competition cam, 6-speed manual, Wilwood brakes/rotors, Forgiato custom wheels. All proceeds to benefit St. Jude Children’s Research Hospital. Will be sold at approximately 8PM on Friday, January 20, 2012. Details: SPX Commissioned this “one-of-a-kind” Ford Mustang created in collaboration with Ford Racing and the amazing craftsmen at Galpin Auto Sports to be auctioned off at Barrett-Jackson’s 2012 Scottsdale auction with all proceeds donated to St. Jude Children’s Research Hospital. Founded in 1962 in Memphis, Tennessee by the late entertainer Danny Thomas, St. Jude Children’s research Hospital treats children with cancer and other catastrophic childhood diseases. SPX is a Charlotte-based, Fortune 500 multi-industry manufacturer with operations in more than 35 countries. SPX’s highly engineered solutions support three critical needs around the world: electricity, processed foods and beverages, and vehicle service. SPX has a history of supporting St. Jude with the help of Barrett-Jackson. As Chris Kearney, Chairman, President and CEO of SPX shares, “St. Jude Children’s Research Hospital is an excellent organization that does amazing work. Over the past two years, we’ve worked with Barrett-Jackson to raise more than $450,000 toward St. Jude’s fundraising efforts, and we look forward to adding to that sum with this year’s auction.” “The 1969 Ford BOSS 429 Mustang inspired this year’s effort,” notes Dave Kowalski, Vice President of SPX. “SPX wanted to blend modern technology and capture the stealthy essence of 60′s muscle cars,” he adds. It seems both 5.0 Mustang Magazine and Rides Magazine agree SPX achieved their goals as each magazine featured the SPX/St. Jude Mustang on their covers. Renowned Galpin Auto Sports (GAS) of California developed the Mustang to “perform as well as it looks,” said Ted Mengiste, director at GAS. Galpin widened the Mustang body nine inches, using all hand-rolled metal fabrication. As Ted points out, “We gave it a blown 5.0L Ford Engine with a competition cam, producing over 700 hp, coupled to a Getrag 6-speed manual transmission and other bits and pieces from Ford Racing.” Wilwood brakes and rotors were installed for braking. While the 22X14 and 22X11 Forgiato three-piece custom wheels with Pirelli Tires help transmit over 630 ft lbs of torque “to the ground.” Its black interior is accented in red suede with headrests that give tribute to St. Jude. Sunpro, a product of SPX, provided gauges. The Mustang audio system is upgraded with massive JLT speakers and amps, while maintaining the original stock head unit. The exterior is painted in a unique PPG red, reminiscent of the 60′s candy apple red paint jobs. Performance lowering spring, Bassani exhaust, BOSS Laguna Seca pedestal spoiler, and the 1969 BOSS 429 hood scoop round out this highly customized muscle car. 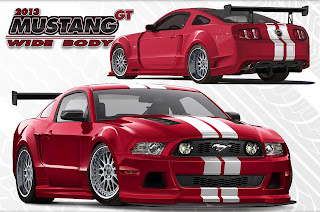 This entry was written by by MustangsDaily (Mustangs Daily) and posted here on Friday, January 20th, 2012 at 9:12 pm and is filed under barrett-jackson, barrett-jackson 2012, galpin, galpin auto sports, galpin widebody mustang, News, spx. This article was not written by us, rather gathered using RSS feeds listed here. We take no credit for this article. You can leave a response, or trackback from your own site.